Micro- or nanoelectromechanical system (MEMS/NEMS) has witnessed explosive growth with applications spanning from automotive, consumer, industry, military, to biotechnology in the past decades. Presently, MEMS are dominated by Si material due to the mature CMOS technology. However, the intrinsic weakness of Si such as poor mechanical or tribological properties and poor thermal stability limit the device performance and hinder the applications of Si MEMS in harsh environments. 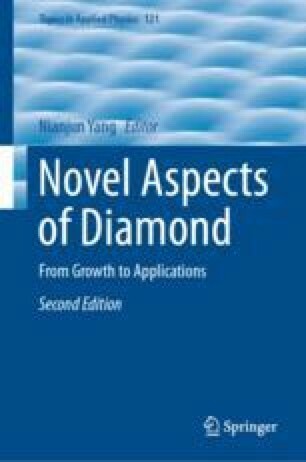 Diamond is an outstanding material for MEMS/NEMS under harsh environments with diverse and much better performance than Si in terms of the excellent properties such as high Young’s modulus, high thermal conductivity, hydrophobic surface, and tailorable electronic configuration of diamond. In this chapter, we review our recent progress in the batch fabrication of single crystal diamond (SCD) mechanical resonators on SCD. The energy loss mechanism in the SCD mechanical resonators were discussed and the strategies to improve quality factors of the SCD resonators were described. This work was partially supported by JSPS KAKENHI (Grant Number 15H03999, 15H03980, 26220903) and Nanotechnology Platform projects sponsored by the Ministry of Education, Culture, Sports, and Technology (MEXT) in Japan.